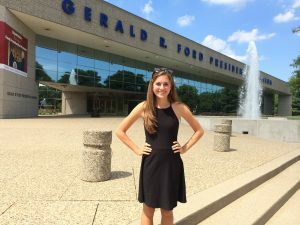 Last summer, when I heard about the grand reopening of the Gerald R. Ford Presidential Museum and the new Devos Learning Center, I knew I had to learn more. I made a visit to the museum, and while there, I had the opportunity to meet with the museum’s education specialist, Barbara McGregor. I expressed interest in volunteering at the museum throughout the summer, but Barbara had a better idea. She was in need of support to prepare for the launch of the new learning center and offered me a special internship. As a student pursuing a degree in secondary education with a focus on history and political science, it was an incredible offer, and I asked how quickly I could start. When the museum was built in the late 1970’s, President Ford was adamant that he did not want the museum to be a shrine to him, but rather, a classroom for democracy. With this vision in mind, the museum has designed dozens of educational opportunities for learners of all ages. I spent the summer assisting with museum events, leading school tours, and developing curriculum. My biggest task involved the development of a curriculum guide for the museum’s current temporary exhibit, Space: A Journey to Our Future. The purpose of the guide was to add historical context to a science heavy exhibit. I was to provide teachers with pre and post visit activities, background materials, and primary sources on the United States Space Program and President Ford’s involvement in it. As a young representative, Gerald R. Ford was on the committee that created NASA, and as president in 1975, he presided over the successful Apollo-Soyuz Test Project. Skills I learned in my history classes at Hope College helped me analyze nearly one hundred primary sources, selected from thousands archived at the Gerald R. Ford Presidential Library in Ann Arbor on Ford’s contributions to the U.S. Space Program. I loved reading the address Nixon prepared to give the nation had we not landed on the moon. Equally intriguing were the monthly newsletters Ford wrote to his constituents while serving in the House of Representatives. Even some of the most unassuming documents contained valuable information. An entire packet of documents was devoted to how President Ford should respond to a successful Apollo-Soyuz mission. While his administration debated whether a call to Soviet Premier Brezhnev or a meeting with the Russian cosmonauts was appropriate, I, as a historian, read between the lines and found a story of U.S. and Soviet relations in the latter half of the twentieth century. A critical reader, well versed in historical literacy skills, can discover important details on the Space Race and intricate nuances of the Ford administration within the context of a single event or memorandum. Background knowledge of dates, United States foreign policy, and international relations at the time allowed me to conceptualize and contextualize the information I found. This way, I was able to withdraw the information and choose the sources that would be most valuable to teachers and students in their studies. John F. Kennedy once said, “For a true historian – and for the true student of history – history is an end in itself. It fulfills a deep human need for understanding; the satisfaction it provides requires no further justification.” When done the right way, museums and classrooms are places where history can come alive and students can actively interact with the past. As a future educator, I want my students to understand that the discipline is more than just rote memorization of facts and dates. I hope they will recognize history’s relevance in their lives and the transferable nature of its skills. Most importantly, I want them to respect the subject because history promotes discovery and reflection, and an understanding of the subject allows us to unlock the true value in its study, the ability to bring meaning to our lives. If you’re in the downtown Grand Rapids area, be sure to check out the newly renovated Gerald R. Ford Presidential Museum and the Devos Learning Center. Previous Previous post: It’s Fulbright Season!